It has been some time since my last write up about my briefings with the Boulder Business Intelligence Brain Trust (BBBT), multiple business engagements and yes, perhaps a bit of laziness can be attribute to it. Now I have the firm intention to regain coverage of these series of great analyst sessions a more regular basis, hoping of course, my hectic life will not stand in my way. So, to resume my coverage of this great series of sessions with software vendors and analysts, I have picked one that, while not that recent, was especially significant for the BBBT group and the vendor itself. I’m talking about a new addition to the analytics and BI landscape called Outlier. Members of the BBBT and myself had the pleasure to be witness of the official launch of this new analytics and business intelligence (BI) company and its solution to the market. Outlier presented its solution to our analyst gathering in what was an appealing session. So here, a summary of the session and info about this newcomer to the BI and Analytics space. Outlier, the company, was founded by seasoned tech entrepreneur Sean Byrnes (CEO) and experienced data scientist Mike Kim (CTO) in 2015 in Oakland, Ca. with founding of First Round Capital, Homebrew, and Susa Ventures. Devoting more than year to develop the new solution, Outlier maintained it in beta through most of 2016, to be finally released in February of 2017 aiming to offer users a unique approach to BI and analytics. Which means that, rather than taking a reactive approach in which the system waits for the business user to launch the analytics process, the system will take a proactive approach and signal or alert when these changes occur, triggering action from analysts. Now to be honest, this is not the first time I hear this claim from a vendor and frankly, as many modern BI solutions incorporate more sophisticated alerting mechanisms and functionality I’m less concerned on hearing it and more on discovering how each software provider addresses the issue of making analytics and BI solutions able to be proactive. During the session, Sean Byrnes and Doug Mitarotonda, CEO and Head of Customer Development respectively, gave us a great overview of Outlier’s new approach to BI and analytics. Here, a summary of this great briefing. Being data scientists themselves, Outlier’s team understands the hardships, complexities and pains data scientists and business analysts undergo to design, prepare and deploy BI and analytics solutions so, by considering this and aiming to take a fresh approach Outlier was born, aiming to provide a new approach to business intelligence. 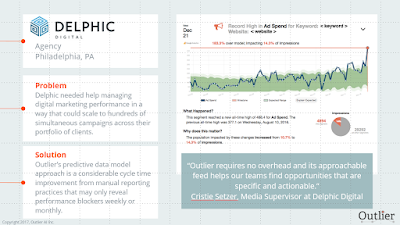 The approach developed by Outlier intends to ―opposed to creating dashboards or running queries against business data analysis requirements― watch consistently and automatically business data and alert of when unexpected changes occur so to do this. 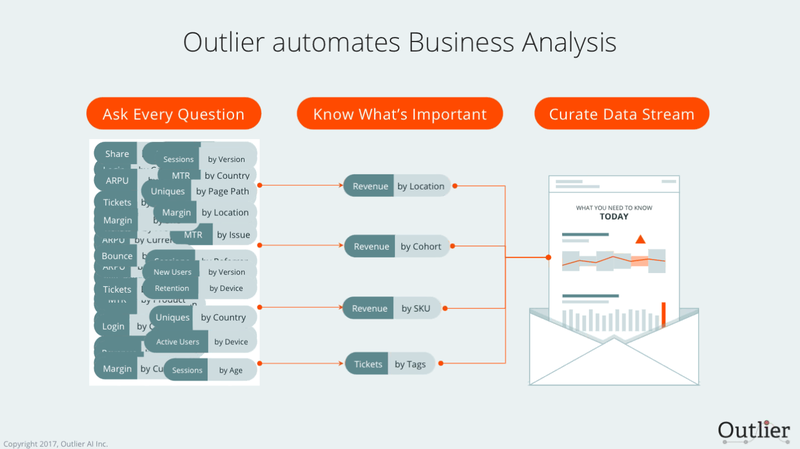 Outlier connects directly to a number business data types in the likes of Google Analytics, Adobe Cloud, Salesforce, Stripe, SQL databases and many others to, then, automatically monitor or watch the data and alert of unexpected behavior. Along with the ability to proactively monitor business data and alert of changes, Outlier can sift through metrics and dimensions, aiming to understand and identify business cycles, trends and patterns to automate the business analysis process and consequently, position themselves in the realm of a new generation of BI solutions (Figure 1). 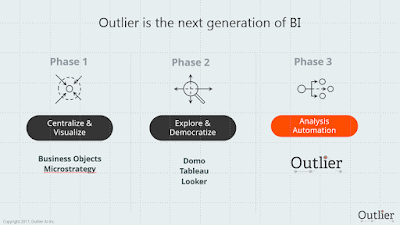 During the BBBT session with Outlier, one key thing brought up by Sean Byrnes was the fact that the company’s leadership understands the analytics and business intelligence (BI) market is changing and yet, many companies are still struggling now, not with the availability of data but with the questions themselves, as the analytics formulation process becomes increasingly complex. 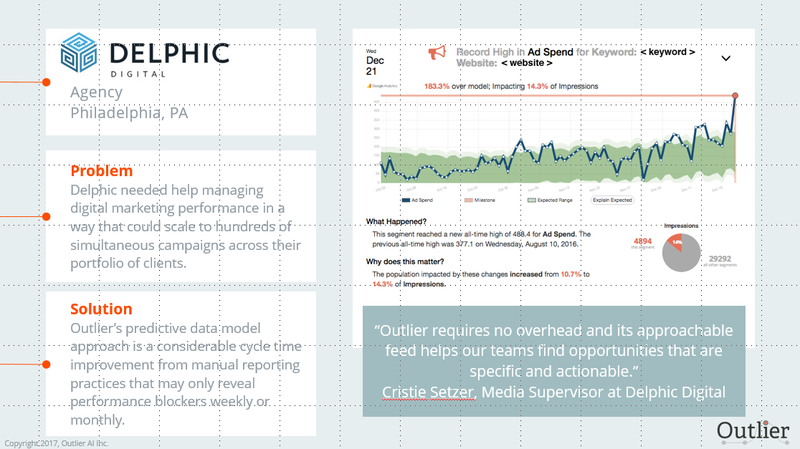 According to the company, as part of a process aimed to automate the monitoring and analytics process and, to help users ease its regular monitoring process, once deployed Outlier can provide daily headlines from key business dimensions, enabling them to ask those critical questions in the knowing there will be a regular answer but still enable them to formulate also new ones to keep discovering what is important (Figure 2). Carry on with common data analysis and reporting tasks and above all that can truly automate the analytics process so it can detect when a significant change occurs. Filter data to recognize what is important to know when making a decision. Today many organizations can know how much they sold last month or, how much they spend on the last quarter, those are relevant yet, common questions that can be answered with relative ease but today, it is now also about discovering not just answers but new questions that can unveil new key insights, opportunities, and risks. Outlier identified this as a key need and acted upon it, knowing that sometimes constructing the infrastructure to achieve it can become far more than a trivial task, as it many times forces organizations to radically modify existing traditional BI platforms to accommodate the introduction of new or additional analytics capabilities ―predictive, mining, etc.― that might easily fit or not with existing BI solutions within an organization. Outlier aims to automate this process by making it possible for organizations connect directly with various sources a business analyst take data from to guide him through an automation of the monitoring process. 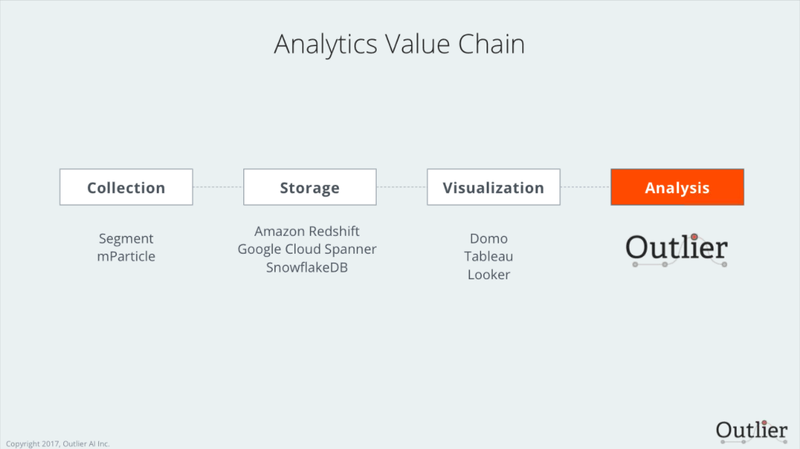 One key aspect of Outlier I find worth mentioning is how the company strives to augment rather than replace the capabilities of existing analytics and data management solutions, and trying to fit within a specific point of what the company calls the analytics value chain (Figure 3). During the demo session, other relevant aspects of Outlier include its functionality for providing new and useful functional elements like the inclusion of headlines and dashboards or scorecards that include nicely a combination of graph and textual information (Figure 4), a large set of connectors for different data sources including traditional databases and social media sources. Also, worth mentioning is the effort Outlier is doing for educating potential users in the field of BI and Analytics and, of course, the potential use of Outlier in different industries and lines of business by making available a section in their portal with helpful information ranging how to analyze customer acquisition cost to performing customer segmentation. As part of a new wave of solutions developing and providing analytics and BI services, Outlier is constantly working in the introduction of new technologies and techniques to the common functional portfolio of data analysis tasks, Outlier seems to have countless appealing functions and features to modernize the current state of analytics. Of course, Outlier will face significant competition from other incumbents already in the market such is the case for Yellowfin, Board, AtScale, Pyramid Analytics and others but, if you are in the search or just knowing about new analytics and BI offerings, it might be a good idea to check out this new solution if you think your organization requires an innovative and agile approach to analytics, with full monitoring and alerting capabilities. Finally, you can start by checking, aside its website some additional information right from the BBBT, including a nice podcast and the session’s video trailer.